GL is a ranking system for carbohydrate content in food portions based on their glycemic index (GI) and the portion size. Glycemic load or GL combines both the quality and quantity of carbohydrate in one ‘number’. It’s the best way to predict blood glucose values of different types and amounts of food. The formula is: GL = (GI x the amount of carbohydrate) divided by 100. 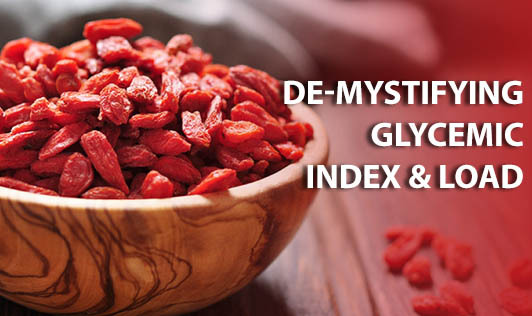 The usefulness of glycemic load is based on the idea that a high glycemic index food consumed in small quantities would give the same effect as larger quantities of a low glycemic index food on blood sugar. Glycemic Load is the product of the Glycemic Index and the grams of carbohydrate (GL=GI*Carb grams). For example, white rice has a somewhat high GI, so eating 50g of white rice at one sitting would give a particular glucose curve in the blood, while 25g would give the same curve but half the height. Since the peak height is probably the most important parameter for diabetes control, multiplying the amount of carbohydrates in a food serving by the glycemic index gives an idea of how much effect an actual portion of food has on blood sugar level. Some have questioned the value of using glycemic load as a basis for weight loss programmes. However, glycemic load is generally a useful concept in programmes targeting health maintenance. Studies have shown that sustained spikes in blood sugar and insulin levels may lead to increased diabetes risk. The Shanghai Women's Health Study concluded that women whose diets had the highest glycemic index were 21 percent more likely to develop type 2 diabetes than women whose diets had the lowest glycemic index. Similar findings were reported in the African American Women's Health Study. A diet programme that manages the glycemic load aims to avoid sustained blood sugar spikes, and can help avoid onset of type 2 diabetes. For diabetics, glycemic load is a highly recommended tool for managing blood sugar.Glycemic load for a single serving of a food can be calculated as the quantity (in grams) of its carbohydrate content, multiplied by its GI, and divided by 100. For example, a 100g slice serving of watermelon with a GI of 72 and a carbohydrate content of 5g (it contains a lot of water) makes the calculation 5*0.72=3.6, so the GL is 3.6. A food with a GI of 100 and a carbohydrate content of 10g has a GL of 10 (10*1=10), while a food with 100g carbohydrate and a GI of just 10 also has a GL of 10 (100*0.1=10).Data on GI and GL comes from the University of Sydney (Human Nutrition Unit) GI database at through. The GI was invented in 1981 by Dr Thomas Wolever and Dr David Jenkins at the University of Toronto and is a measure of how quickly a food containing 25 or 50 grams of carbohydrate raises glycemia. Because some foods typically have a low carbohydrate content, Harvard researchers created the GL, that takes into account the amount of carbohydrates in a given serving of a food, and so provides a more useful measure. Glycemic Load also has a scale. Low is 10 or less, Medium is 11-19 and 20 or greater is considered High.